The past 5 months, I've had the privilege of helping organize an amazing event in Corvallis. It's called the Corvallis Pulse and is happening Wednesday, February 26th from 8am - 2pm at LaSells Stewart Center Austin Auditorium. It's going to feature 8 Corvallis business leaders who will share their own perspective and insights on the state of the Corvallis market. Each talk will be concise and information packed – no more than 20 minutes each. You'll also have the opportunity to discuss, debate, and dive deeper with each speaker during breaks. The cost of the event is $25. Lunch will be served and the event is not-for-profit. All net proceeds and donations will be given to Benton Habitat for Humanity in Corvallis. The event is going to be great! This is the story behind the Corvallis Pulse. It started back in October when my realtor, Lee Eckroth, came to me with an idea. I had been making real estate reports for him for the last couple years and that report was now starting to be used by the entire Town & Country Realty office. In other words, it was incredibly useful. So, at the end of a real estate investor club meeting, Lee comes to me with this idea, "What if I turned the report into a presentation and talked about it for four hours." My response: "I love the idea, except for the part where you talk for four hours." Ha ha. We all laugh at the awkwardness of my blunt statement. But the seed of the idea is there. We started talking about the importance of real estate. How it plays an essential role in our personal lives and in the economy. How residential real estate provides housing for families, and is an important source of wealth and savings. How commercial real estate creates spaces for jobs in retail, offices and manufacturing. How real estate income provides a source of revenue for many! Income generated from real estate related industries is $18,972. Additional expenditure on consumer items such as on furniture and appliances is $5,647. Expenditure on remodeling within 2 years of purchase is $4,451. It also generates an economic multiplier impact with greater spending at restaurants, sports games, and charity events. The size of this "multiplier" effect is estimated to be $13,953. Crazy, right? We started to hone in on this idea that real estate really is the pulse of the economy. Don't believe me? Look at what happened in 2007 when real estate crashed... The rest of the economy followed. So we knew giving some kind of real estate update would be valuable to the community, but the idea of Lee giving a four hour talk still sounded horrible. Then inspiration hit... what if we did something similar to TED? We could have 8 speakers talk for 20 minutes each instead of 1 for 4 hours. They could each bring their own perspective of how the Corvallis market is doing. We also knew this could be a great time to create discussions and so we wanted time for individuals to be able to meet with each speaker. 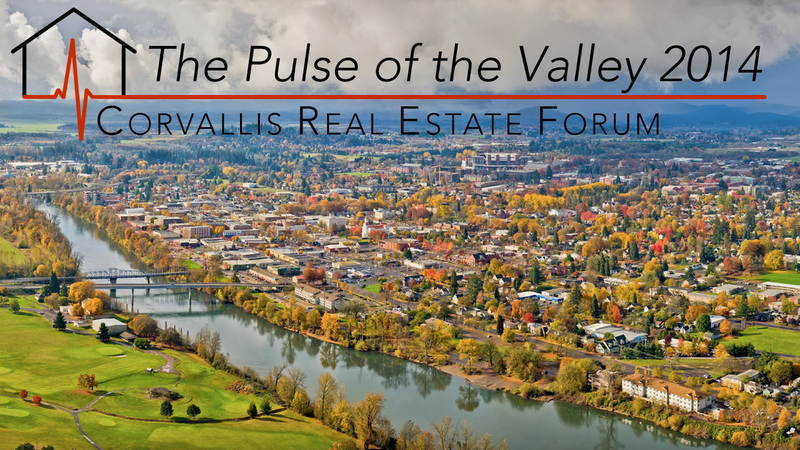 The name of the event wrote itself: The Pulse of the Valley 2014: Corvallis Real Estate Forum. Fun fact: Corvallis means "Heart of the Valley". Boom! We started floating this idea to others and they loved it. Town & Country, Mortgage Express & the Corvallis Chamber of Commerce all instantly jumped on board to sponsor the event. We even had another company so inspired by the event that they're given an additional donation to Habitat. Now all we had to do was find speakers and put the event together. We also quickly decided this had to be bigger than Lee. In following the Go-Giver model we wanted this event to be a gift to Corvallis. We intentionally decided to NOT make this a recruiting event. Sure, Town & Country is sponsoring the event and Lee is one of the eight speakers, but they are going out of their way to make it clear it's not about them. Plus, next year we want to have different sponsors and speakers which will really help drive the point home that it's bigger than all of us. One person we're excited to have on board is Julie Manning, the Mayor of Corvallis. She'll be giving an introduction to the event. Again, because she recognizes that it's an event ABOUT Corvallis, FOR Corvallis. Furthermore, our intent is to package up this event by creating guides and how-to's and give it away for others to put on in their cities. If a bank in Salem wants to put on the event, they can. Again, this event is bigger than just us and Corvallis. We get asked this question a lot. Why charge $25? We already have sponsors and the money is going to Benton Habitat for Humanity. Good question. We started out with a desire for attendees to have skin in the game and for them to also be giving to Corvallis as they walked in the door. Our first idea was to require 3 cans of food... but we quickly decided we didn't want to manage that. I'll be honest, I wanted to charge $50 to send the message that this is a premium event. The Pulse Team had a better idea: charge less and give the money away. For professionals, who are expensing it anyways, $25 is manageable. Some courses charge hundreds of dollars for their material and I like they way they think about it. They'll say things like, "If you're in business, you know the value of what I'm sharing and the great price I'm offering it at. If not, it probably means you're not actually in business and so this course isn't for you." That's how I like to think of this event too. If you don't want to pay $25, you probably won't be inspired to take action on what you learn anyways. For a deeper understanding, read about 1,000 True Fans by Kevin Kelly. My wife, Jessi, is the Director of Wow in Lee's office (another reason why I got roped in to helping). Her job is to add wow to everything. She doesn't think she does a good job of it, but everyone else knows better. I like to think of her as "Quality Control". Her expectations of "good enough" are so high that something has to be perfect, and awe-inspiring before she likes it. We joke all the time that I need to run everything I create (charts, videos, blog posts) by her before sharing broadly because she represents the normal person. That's partially true (I can be an odd duck), but it also because she catches ALL my little mistakes and forces me to make it better. Oh yeah! Jessi and Jenny have been working super hard to make this event magical. We do that literally in one way by having Hart Keene act as our emcee. He's a magician who's been on America's Got Talent! and does "strolling mingle magic". We think it'll make the event really special. We also have food, gift bags, inspirational quotes, greeters and great music. In many ways, it's a mini-convention. If you haven't figured it out yet, I'm really excited about this event. I've gotten to preview each of the speakers talks, and I guarantee you'll be empowered with knowledge and inspired to action. I know Jessi and I are already changing our plans based on what we've learned. If you can make it, I strongly encourage you to register and come. I'm honestly not sure how we're going to top this next year. James, I can totally relate. All my life growing up, I wanted to excel at everything I did. Come college, I realized everyone else was also trying to excel at everything. I realized I had to pick one thing - a senior goal in life that superseded all others. So I decided that more than anything, I wanted to be a great husband and father. (Like my dad. Only taller.) It's tough letting go of career and other aspirations, but once you have that goal in mind, it makes choices a lot more obvious. Thanks for the encouragement! Now I just have to decide what I want more than anything. Did you use any specific kind of grease? I have never had to grease hubs before. I am sure I should be able to just want to make sure I use the right stuff when I do. I just want to my local car parts store and bought what they had. That way I was sure to have something made our automobiles. Specifically, I got Master Pro Grease: Multi-purpose Lithium Grease. how much did the parts to build the box and flooring cost you? Good question Doug - Looking back, it looks like I spent $114 on the wood & hardware at Home Depot. The wall locks were from Red Trailer, and cost $30. Re. the bed, I've noticed that you have recessed the under sides of the boards, so that it sits flush on the frame. How did you do that? To be honest... I did it in a very unsafe way. Where there was a bot sticking up (the corners, if I remember correctly), I took a skill saw, held the guard up, and slowly cut/chiseled away the wood. Like I said, not very safe, but that was the tool I had and it worked. What thickness is your walls? Also, have you driven this on the highway long distances? Asking because I'm thinking about using one of these to move from Wisconsin to Florida. Just boxes would be transported. I used 1/4" plywood since I didn't need it to be heavy duty. I have only driven short distances on the freeway. I would recommend putting new grease into the hubs. I went to my local car parts store and bought something made for automobiles. Specifically, I got Master Pro Grease: Multi-purpose Lithium Grease.